While it will likely be a while before word gets to bands outside of Canada, the temporary foreign worker program has been revised, allowing artists to enter the country without paying a steep head tax on everyone in their band/entourage regardless of what type of venue they're playing - so long as it's not a permanent gig. I know, I can't think of a musician with a permanent gig either. This is great news for Canadian music fans, but there is a downside - we already have a reputation as a country that's difficult to tour through thanks to geography and bureaucracy, and the ghost of this tax will be floating around for a while to come. New to the Buzz Records family, Mexican Slang are going on tour - I love Brooklyn Vegan because it makes me feel safer here with you cuddly blogTO commenters. Aside from the press pic, why be mean to Mexican Slang? It's like listening to Hole from a K-hole. Preorder their debut EP Inside the Velvet Castle here. Hamilton almost-star Jessy Lanza's shared a new r&b/electronic track from the Hyperdub 10.2 comp, which drops July 21. It's lov-el-y and includes some breathy raps and unpredictable production. Actual Water are releasing their new album Call 4 Fun tonight at Smiling Buddha. In this video they ride philosophical waves about being Actual Water - cheekily, naturally. Jennifer Castle's Pink City is out on idee fixe September 2. The first single is a sad music box folk song. Babe Rainbow understands that your memory and the hype cycle only last one week tops, so he's back with new sounds again. You can download this minimal, ambient track free and grab the sheet music for violin here on DIS Magazine - thanks Babe Rainbow. Toronto's glitter-graphics electronic scene is picking up, and this HVY WTR / Fan Fiction / Healing Power Records / Steph D piece has its eyes mostly shut, shuffling through the late night fun zone in a neon jacket that asks, why go home? This scroungy bar is home. Missed this earlier in June, when I needed it most - a fun punk song about epic fails. It's a quick one - the music portion of this video is about 40 seconds long. Get Unfinished Business' Mix n' Mash cassette via Heretical Objects. Tags include noise, punk, sludge, hiss, feedback, diy, bass vi, loud, and rock and roll. But they have a marketing agent! That's not DIY, guys. Anyway, I'd add garage to those tags and call this a pretty alright snack for Nirvana/Pixies/DFA1979 fans. TV Freaks (Hamilton) are talking about leeches and mommy issues on their Leeches 7". They're calling it power pop punk, which is what I'm going to run my future car with. Newgrange and Blakkr Nio's The Doppler Effect is our drone/metal release of the week. The sparse collab between Ireland and Toronto is free for download. Stream a track below. I only like men who paint their faces like puppy dogs. Why should WorldPride end with a parade? 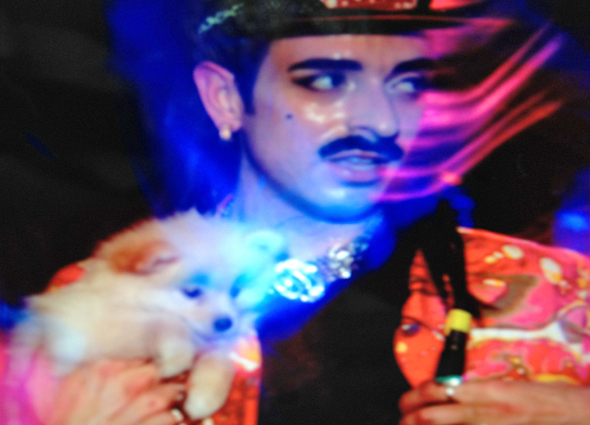 Better to end it with brilliant, John Waters inspired gutter pop / video art icon Cody Critcheloe (NY/Kansas), aka SSION. From art punk all the way to electronic cult star, SSION is constantly evolving and, most importantly, puts on a great show. First Thursdays are kinda weird, but this is worth it. 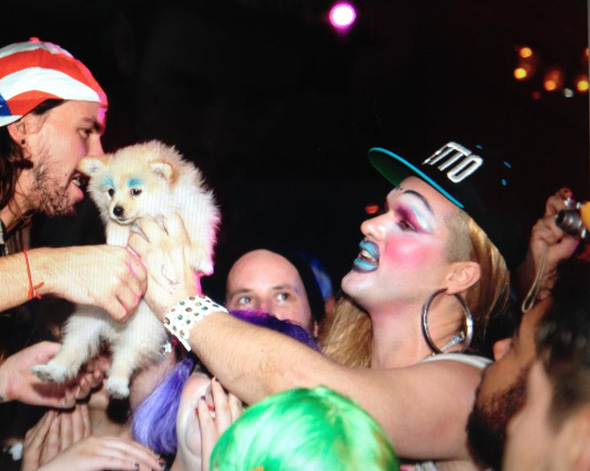 Dogs rule, but definitely don't bring your dog to a SSION show like this one person did, please. Cody will not be impressed. July 3, 7pm, AGO (317 Dundas Street West).